Eva Holland is a writer based in Whitehorse. My alarm beeped in the darkness of the tent at 7 a.m. I opened my eyes, fumbled at my wrist to shut the old Timex off, and shifted awkwardly in the narrow trench that my body had formed in the snow. I listened for the sound of a Ski-Doo, but the morning was silent, the sun still yet to rise. There was nothing else to do, so I allowed myself to doze off again. For another hour or so, I drifted on the edge of deep sleep, waiting for an engine to wake me. No one came. Eventually, I sat up, unzipped the tent door and poked my head outside. The day was lightening, and I could see my campsite for the first time: a small break in the trees, just a meter or two off a snowmobile trail. I’d stopped here around 1 a.m. the night before. The other racer I’d been travelling with had carried on down the trail, saying that he felt it was too cold to camp, too dangerous to stop moving. I’d wondered if he was right, but walking all night also meant risking hallucinations, hypothermia, and compromised judgment. I’d pitched my tent by the dim light of a headlamp that was fading in the extreme cold. I had practised with the little one-man unit a half-dozen times before – in minus-10 degree weather, in minus-15, in minus-20 – and it had given me no trouble. But last night, the fabric had refused to shake out like it normally would. I’d had to unfold it like fragile origami as it crunched and crackled in my hands. I was afraid that the nylon, frozen to a new state of solidity, might rip or even shatter, like the lettuce that we’d blasted with liquid nitrogen in a school science class years ago. The tent poles had refused to bend, too, and I’d forced them into place, feeling angry and suddenly afraid. I knew that every second I gripped their smooth, frozen metal increased my risk of frostbite. That was when I’d begun to realize just how cold it must be. 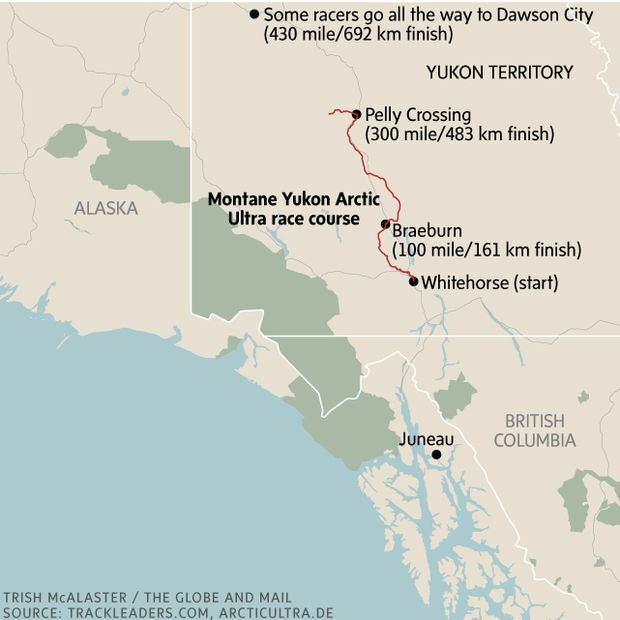 The Montane Yukon Arctic Ultra is billed as the world’s coldest and toughest ultramarathon. (An ultra is any distance greater than the standard 42-kilometre marathon; they can range from 50 km into the hundreds of kilometres.) When I signed up for the 2018 race, I expected the race to end one of two ways. First, the triumphant vision: I travel across 150-ish kilometre of frozen, snow-packed trail through the Yukon wilderness, towing a sled loaded with everything I need to survive. I arrive, exhausted but elated, at the finish line; my friends greet me there with a cold beer. I kneel, pull down my frost-covered balaclava to kiss the finish-line banner, and can barely stand up again afterwards. We all laugh as I wobble to my feet. Later, I post the video to Facebook and the likes pour in. Or the alternative: I fail. I stagger along as far as I can, but am too weak, in both mind and body, to reach the finish line. My left hip flexor, which has been bothering me off and on throughout my months of training, seizes up again. The tightness in my hip irritates my knee, and then my calves and ankles begin to complain. I can’t take the pain or the cold or the loneliness. I get scared. I give up, I quit and I call for help, pushing the button on my emergency beacon that will see me whisked off the trail to safety. Why would I sign up for a 150-km winter trail race when I’ve never run further than 12K before? I gave friends and family various reasons. I wanted a fitness project to get me through the darkest, coldest months of the Yukon winter. I wanted to test my winter camping and winter travel methods under stress. I’d covered the race, and other hellish endurance events like it, as a journalist, and I wanted to know what it was really like to be out there on my own. Those answers were all true. The truest answer, though, was in those two competing visions. I wanted to know which racer I would be – the finisher, or the failure? The only way to find out was to enter the race. Eva Holland walks below the clay cliffs of the Takhini River, about 10 kilometres from the checkpoint at Muktuk Adventures, in the Montane Yukon Arctic Ultra. By December, I was training for 15 to 20 hours each week. On Dec. 1, I’d added weight to the mix, and now I tramped around the snow-thick trails behind my Whitehorse neighbourhood harnessed to a loaded plastic sled. On Saturdays, I walked for 20, 25, 30 kilometres at a stretch, then got up the next morning and went out again, trying to train my body to rebound, to function when it was already tired. I walked the trails before sunrise, by headlamp, and I walked them at midnight, trying to get myself accustomed to the lonely cold and dark. 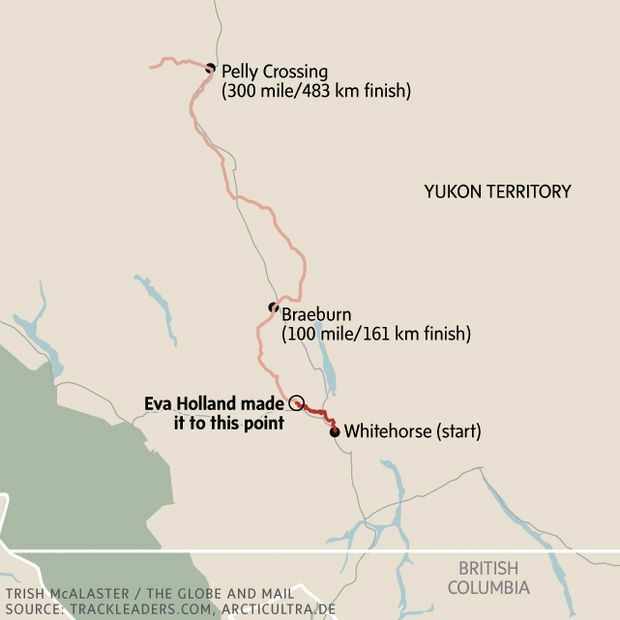 When I’d reported on the 2014 Yukon Arctic Ultra, for a local magazine, I’d been unable to pry any real insights out of the athletes I interviewed. What were they doing here? Why would anyone willingly pay to walk through the frozen Yukon backcountry for days on end? What was the appeal? They’d said things like: “Well, I’ve done a hot race, so I thought I’d do a cold race.” I was dissatisfied with their answers – there had to be more to it than that. And already, in training, I knew that I’d been right. I was beginning to understand the draw, and it was about much more than the lure of that vision: me, triumphant, at the finish line. My calf muscles grew, and my thighs shrank. My stomach hardened. My Netflix usage plummeted. As I organized my life and my job around an increasingly demanding training schedule, I found myself working more efficiently. I ate better. I slept better. I even flossed more frequently. I was becoming a better version of myself, it seemed. I wanted to hold onto that feeling; I was already thinking about what training project I could take on next. On Dec. 30, I went on my longest outing yet: a 35-kilometre march from my house to a hot springs on the northern outskirts of town. It was minus-31 when I set out in the mid-morning, and by the time I’d turned onto the hot-springs road, a few hours later, the sun was setting and the temperature had dropped several degrees further. As I walked, my toes ached in my shoes, and my fleece face mask froze solid, blocking my mouth and preventing me from eating or drinking. I told myself that this was a good thing, exposing myself to a worst-case scenario ahead of time. I prayed that the temperatures on the race itself would not drop nearly so low. Back in 2014, my friend Karl entered the 100-mile foot race and won it, covering the entire distance in just less than 24 hours. He was an outlier among the competitors – a climber, hiker and paddler, but not usually a runner; he’d never entered a foot race of any distance before. He regarded the Yukon Arctic Ultra as an experiment he was enacting on his own body. He told me at the time: “It’s cool to see how far you can actually go in a day, if you just keep moving.” As far as I know, he’s never run another race since. Most of the competitors drawn to the event, in contrast, tend to be serial ultraracers. They fly in from other continents, sometimes checking the Yukon race off their lists and moving on to the next item, sometimes returning year after year. There’s a sort of informal circuit of ultramarathons held in extreme environments around the world: There’s the Gobi March, in Mongolia, and the Marathon des Sables, in Morocco. The Leadville 100, in Colorado, takes place more than 3,000 meters above sea level, while the Badwater 135 sends racers through California’s Death Valley in July. 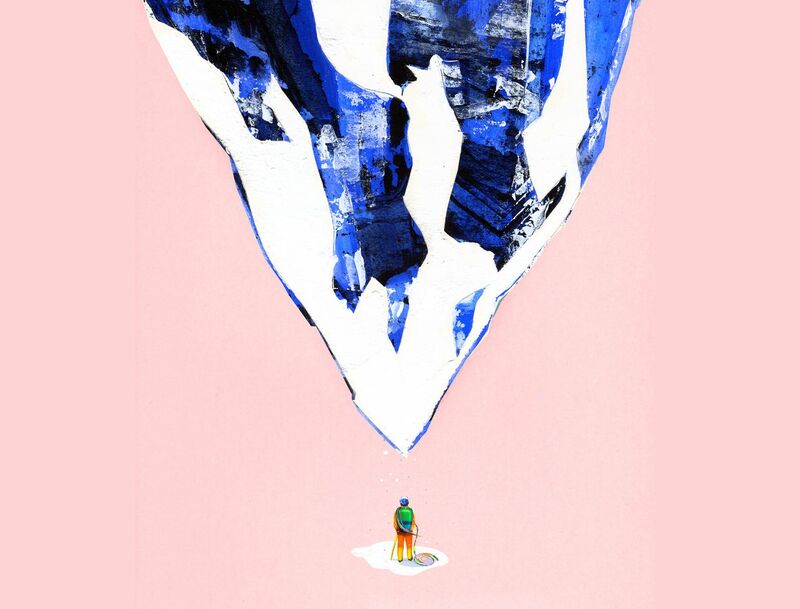 If you have the means and the desire, you can even attempt an ultramarathon in Antarctica. These sorts of events are commonly known as sufferfests. They reward athletic ability to a degree, of course, but also raw stubbornness: persistence, tenacity, drive, pain tolerance. They are often regarded by competitors as a binary, like a pass/fail grade: Either you finish, or you don’t. A given racer might have a time goal, or some hopes in terms of their ranking, but that’s always secondary to the primary objective. In the Yukon Arctic Ultra, the medals handed out at the finish line are all identical. First place or last place – either way, you’re a finisher. For the most part, these sufferfests draw a different breed of athlete than the amateur runner who’ll spend weeks or months trying to shave time off their personal best 5K, or chasing, say, a sub-three-hour marathon. (Acts that also require tenacity, drive and pain tolerance, but in a different recipe.) So what drives people to travel the world, signing up for these extreme events? I think that they are often seekers of experience – of visceral, unusual, unforgettable sensory experience. Like Karl, they are curious about the outer limits of their bodies’ abilities to function under pressure. But the setting, the wild landscape, is part of the lure, too. One of the British racers I spoke to mentioned that he’d never before seen a night sky so full of stars. Another, recalling a moment when his feet had gotten soaked and his shoes had begun to freeze solid, said that for him, that shot of adrenaline was the point. One woman compared the race to meditation. 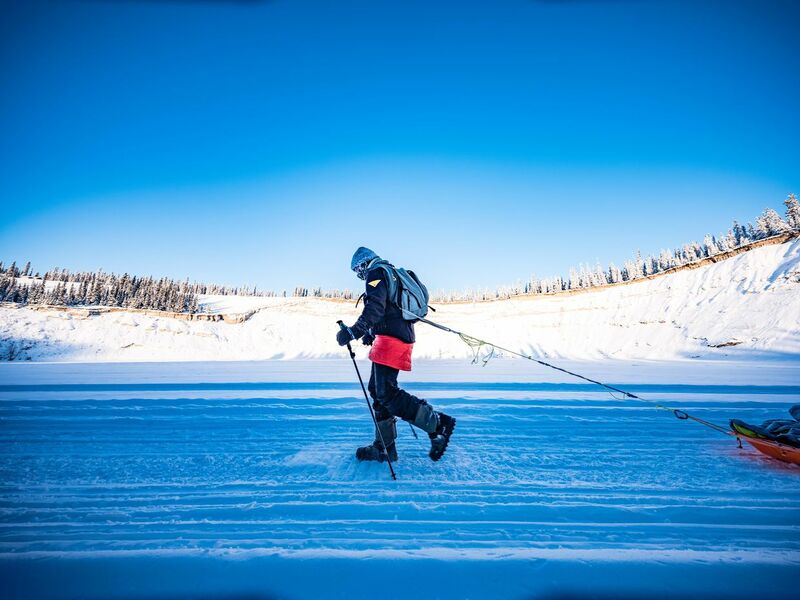 Many of them talk about the challenge, not just physically but mentally – races such as the Yukon Arctic Ultra offer an opportunity to test yourself in brutally tangible ways. How often do most of us in the middle-class, white-collar world face those sorts of demands? Unless you’re a helicopter pilot or a heart surgeon, the answer might be never. The Yukon Arctic Ultra offers a way to change that. The Dawson Overland Trail just north of Whitehorse. 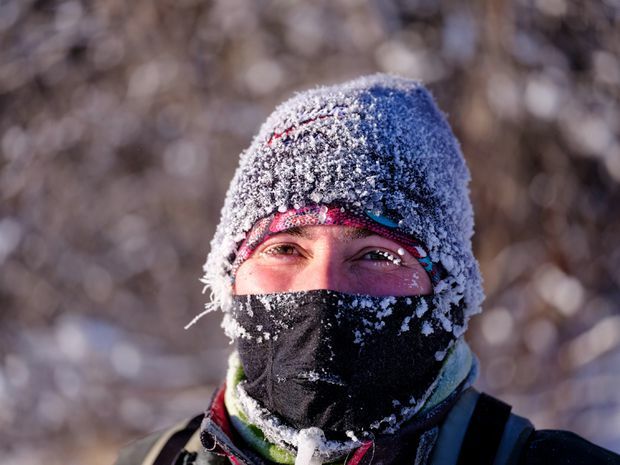 It was a clear, cold morning – about minus 30 – when the racers first set off from the Yukon capital. The morning of the race dawned clear and cold in Whitehorse: one of those bright, diamond-hard winter days. I drove myself downtown with all my gear loaded into my hatchback, squinting into the rising sun. Fog billowed off the patches of open water on the fast-moving Yukon River, cold water meeting colder air. It was about minus-30, and forecast to warm up for the afternoon, to a balmy minus-25 or so, before temperatures plunged again overnight. It was Feb. 1. In the month since my hot-springs outing, I had mostly managed to squash my worries. I had rested over the past two weeks; I felt strong and ready. It was colder than I’d hoped – the ideal temperature for the race, I’d figured, was about minus-15 to minus-20. Warmer than that and it got harder not to sweat too much, soaking through your layers. Colder, and, well, everything else got harder instead. It was too frigid to stand on ceremony. The racers gathered at the start line just a couple of minutes before 10:30 a.m., posed for a group photo in front of a small crowd and then scattered to hitch up our harnesses and sleds. We counted down from 10 and were off. The race course led us through Shipyards Park and out onto the frozen Yukon River. The athletes registered in the regular marathon quickly raced ahead, unencumbered by sleds and gear, and the rest of us, 100-milers and 300-milers, shuffled ourselves into single file on the narrow, packed trail. I had done nearly all my training alone, on empty trails, only passing the occasional jogger or dog-walker, and I found it strange and awkward to be in a convoy for the first hours of the race. When one person paused to eat or drink or adjust their layers, they stepped aside into deep snow and the rest of us passed them by. Within an hour, I’d layered a fleece neckwarmer over my merino balaclava to better protect my face from the icy air. Within two hours, I’d pulled my insulated overboots on over my trail runners. They were heavy, and I’d intended them for emergencies only, but my toes were already going numb in the cold, and I wanted to take no chances of frostbite – an automatic disqualification from the race. Eva Holland, her balaclava covered in frost, takes in the late daylight on the Takhini River. Staying warm is essential during the race, since frostbite brings automatic disqualification. The trail followed the Yukon River for just less than 20 kms before swinging left onto the Takhini River. I saw the turn coming well before I reached it, recognizing the Takhini’s tall clay banks from the times I’d paddled the river in summer. 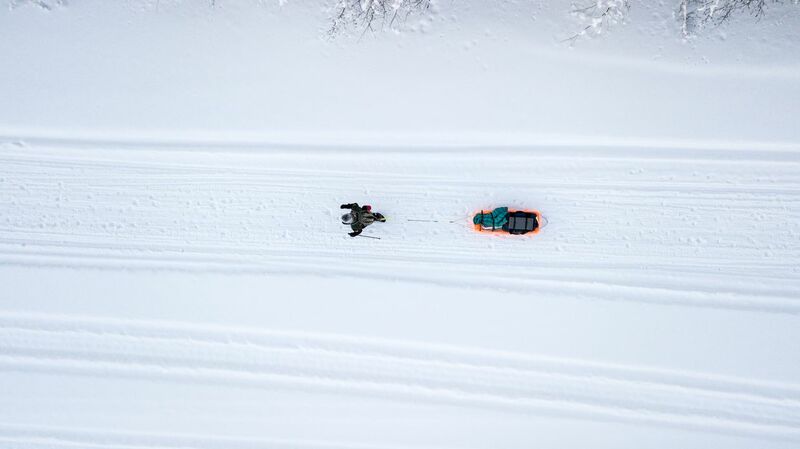 It was surreal, the collision of the oh-so-familiar scenery with the oddity of my mode of transportation now: trudging along the river’s frozen surface, swathed in down and fleece and nylon, towing a plastic sled. At the confluence, I accepted a hot cup of tea from race volunteers and then carried on upriver. A local photographer, Mark Kelly, had made plans to follow me on and off throughout the race, and as I made my way up the Takhini, he leapfrogged me on his snowmobile: pulling ahead to set up a promising photo, letting me go by, then racing ahead again. As the afternoon wore on, the low-angled winter sun gave the river and the cliffs a golden glow. It was beautiful. It was also deceptive, the scenery drenched in light whose warmth didn’t touch me. As dusk deepened into night, I stopped at the first checkpoint, which was also the marathon finish line, for a bowl of stew and a mandatory frostbite check of my hands and feet by the race’s volunteer medics. Then I headed back out onto the river, feeling unexpectedly strong. Nearly eight hours into the race, I was ahead of my planned schedule. That triumphant finish-line vision started to feel less distant, more real. The evening was glorious. The racers had finally spread out so far that I walked alone, no other headlamps in sight, on the hard-packed trail. I was making good time, and – somehow – I was having fun. Every so often, I paused and turned in a full circle, drinking up the wide frozen river and the snow-etched cliffs above me. The stars came out, slowly filling the dark, cloudless sky, and I craned my neck and took them in, my breath fogging up the view. It got colder. Despite the deep freeze, it had been an oddly humid day and I was covered from head to toe in a layer of frost. My mitts were damp with condensation. As the night wore on, they froze into solid lumps, and I pulled on my bulky overmitts to thaw them out again. Around 10:30, I popped up off the river and onto a long-standing route known as the Dawson Overland Trail. I passed another racer on my way up the bluffs, digging in his sled for a bulky warm hat. He seemed glassy-eyed – whether from exhaustion or just cold, I couldn’t say. I asked him if he was all right, and he nodded yes. I carried on. I passed a pair of racers stoking a bonfire outside their tents, then three more racers curled up in bivy bags in the snow just off the trail. I was surprised people were camping so early – my own race plan called for me to rest from 2 or 3 a.m. until 7 a.m. each morning. At midnight, I caught up to a tall Swiss man, a 300-miler, as he paused on the trail. We walked along together for an hour, mostly in comfortable silence. I still felt wide awake, and strong. I was surprised at my resilience – I’d expected to be drooling with exhaustion or staggering through the pain in my joints by now. I guessed that I’d covered roughly 60 kilometres, two-fifths of the total distance. Not bad for the first 14 hours of a race that I had 72 hours to complete. The Swiss man, Martin, planned to just keep walking. We were safest when we were on the move: our blood flowing, our bodies warm. I wondered if I should stay with him or stick to my own plan. The risk of carrying on all night was that I might exhaust myself so much that, if I found myself in trouble, I’d no longer be able to make the right choices. But it was tempting to keep moving, rather than setting up camp alone. As if the thought of my sleeping bag had opened a door, exhaustion hit me at 1 a.m. I felt my thoughts turn slow and muddy, and my legs worked harder to match Martin’s long strides. I said goodbye and dropped back, deciding to call it a night. But as I wrestled with my tent in the cold, I wondered if I’d made a mistake. After an anxious struggle, I got the frozen shelter set up without tearing its fabric, and climbed inside with my sleeping gear. I inflated my Therm-a-Rest and then I tackled my ice-covered layers, intending to change into dry clothes for bed. I pulled off my mitts, leaving only my damp liner gloves on, and attacked the set of rime-covered zippers at my neck. The pain hit within seconds: a sharp stab in three fingertips on my right hand. It shocked me into clarity. I pulled off my liner glove and peered at my hand in the fading light of my headlamp. My fingertips looked like pale white candle wax, dead and cold. I shoved my hand down the crotch of my pants – my only readily available heat source – and dropped a loud f-bomb into the cold, quiet night. On cue, my headlamp flickered into darkness. For the first time in the race, I was really afraid. For a minute or two I crouched there, still and scared, considering my situation. I was alone in the dark, on a brutally cold night, with a flimsy nylon shelter and a frostbitten hand that could only get worse if I didn’t keep it protected. There was no ejector seat for me, no easy or obvious way out. Even if I pushed the button on my beacon to call for help, we’d all been told that the volunteers would not be risking themselves to come rescue us at night. Daylight was hours away. Once I realized that I had no real option but to stay where I was, my fear faded. One-handed, I jerked my sleeping bag out of its sack and crawled in. I kept my hand down my pants until my fingers looked and felt like human flesh again, and then, in several short bursts, I dug out dry liner gloves and changed for bed. The pain spiked every time I exposed my hand to the cold again, and I tried to keep each flare-up brief. I knew that my race was likely over, but I held on to the hope that in the morning, in daylight, things might seem less grim. Maybe my exhaustion was affecting my judgment. Maybe I was totally fine! Mark, the photographer, had promised to find me in my tent at 7 a.m., as I was prepping to start my second day on the trail. He’d wanted to get some shots of my headlamp lighting up the tent in the pre-dawn darkness. In the morning, I decided, I would ask his opinion. I went to sleep with my injured hand curled up, bird-like, in my good hand, my frozen fingertips pressed against the warm pulse of blood in my neck. Eva Holland pulls her sled along the Takhini River on Day 1. By the morning of Day 2, she had second thoughts about whether she could go on. In the morning, Mark didn’t appear. I was angry, briefly, thinking of him at home asleep in a warm bed in a real house. I wondered if his snowmobile had failed to start in the cold. But whatever had happened, I was on my own. I could keep walking forward and try to reach the next checkpoint, several hours away, without letting my fingertips turn black. But even if I got there, I’d likely be disqualified for frostbite. I could try to find my way back out to the road, but then what? I had no real options, I realized. There was only one logical next step. At 8:12 a.m., I pushed the button on my SPOT device, the GPS-powered beacon carried by all the competitors. Now my race was officially over. I had summoned help, and in doing so I had scratched from the event. I got back in my sleeping bag and prepared to wait out the hours until my rescuers arrived. As I lay there, listening to the morning’s silence, I realized that no other athletes had passed by my camp in hours. I began to suspect that I wasn’t the only racer who was in trouble. I turned out to be right. A half-dozen of us had pushed our buttons that morning, and we weren’t the only ones to scratch that day. Four out of the eight racers attempting the 100-mile event were out of the running by the time they reached the second checkpoint, and in the end just a single athlete out of 21 starters finished the 300-mile race. Not many finishers’ medals were handed out this year. If we were seeking out unusual sensory experiences, well, we’d gotten what we wanted. None of us knew it at the time, but the temperatures that first night, as we climbed off the frozen Takhini and onto the Overland Trail, had dropped into the minus-forties. A race that was always dangerous and gruelling had become even more fraught than usual, and as I’d learned when I thoughtlessly touched my damp fingers to frozen metal, it only took a minute or two of inattention to end a racer’s efforts. I snoozed off and on through the morning until, around 10:30, I heard the whine of a Ski-Doo approaching. I poked my head out of the tent into a bright, sunny day, and found Mark pulling to a stop alongside me. It turned out that he’d been trying to reach me since 6:30 that morning, but had been stopped three times by other racers along the trail, all in need of rescue. He fed me hot tea and a granola snack, and packed up my tent and gear while I pulled on my warmest dry layers, protecting my injured hand as best I could. I pressed my face against his back as we rode down the hills I’d climbed the night before, trying to hide from the bite of the freezing air, and thawed out in the cab of his truck, eating more granola, while he stowed the snowmobile in his truck trailer. I was home in my apartment by 1 p.m., just 27 hours after I’d left for the start line. For the first time, I had the space to reflect – or, if I’m being honest, to stew. In the tent, everything had seemed so clear. I was injured; my race was finished. But now I went over and over the events of the night in my mind. What could I have done differently? Where did I go wrong? Did I really have to push my button this morning, or did I take the easy way out? Maybe I could have soldiered on, I thought. Maybe my fingers would have been fine. The fingers in question were red, swollen and sore. In the following few days, it would hurt to type. They would flare with a sharp, stabbing pain when I exposed them to the cold – I stayed inside, for the most part, for that first week. Nearly a month later, the skin would crack and peel away like a sunburn. And in case I needed a reminder of how mild my case was, other racers were facing much worse. A British athlete would lose three toes to severe frostbite, while an Italian who’d become disoriented and left his sled and tracker behind on the trail, wandering alone for hours before he was found, faced the likely amputation of both hands and both feet. For weeks after the race, controversy swirled. Could the organizers have done more to keep us safe, and should they have? Had we all simply gotten what we signed up for? What does it even mean to be “safe” in a race like this? For my part, I knew that no outside help could have changed the outcome of my race. Still, it was hard to silence my doubts and regrets. I was proud of how far I’d gotten, and how good I’d felt in doing so. I was also disappointed in how quickly it was all over. It seemed cruel that my body (three fingertips aside) had held up so much better than I’d expected it to, and that I’d even, against all expectations, been having fun – only to have the race snatched away from me. I tried not to focus too much on that finisher’s medal. After all, in most respects, I’d achieved my goals, satisfied those various reasons I’d given to others before the event. I had spent the winter outside, pushing my body, breathing in fresh, cold air and feeling better than I ever had in past Yukon winters. I was in the best shape of my life; my winter-travel systems had been well and truly stress-tested. And I understood, now, why the racers I’d interviewed four years earlier kept coming back for more punishment, even if they hadn’t been able to articulate it to me then. I’d always have the memories of that giant moon swinging above me as I traveled up the frozen Takhini. But, had my frostbitten fingers not thwarted me, could I have finished? I still didn’t have the answer to my question, the riddle of the finish line and the failure. I still don’t. The only way to find out, I suppose, is to try again.